Riding high after Tuesday night's midterms - which saw his Republican party widen their lead in the Senate while averting a "blue wave" Democratic sweep of the House - President Trump has wasted no time spinning the results as an umitigated win for his "America First" agenda (even as more than two dozen Congressional races have yet to be called). And as he braces for two years of struggling with Democrats in Congress, President Trump said early Wednesday that he will hold a White House press conference to discuss "our success in the midterms." Of course, now that the midterms have ushered in a new era of divided government in Washington, Trump knows he will need to find a way to work with the Democrats. And the Democrats also know that they will need to work with him "for the good of the country," as his senior advisory Kellyanne Conway put it during comments to the press last night. The conference comes after Trump threatened to fight back against any Democratic investigations in the House into his taxes or alleged Russia ties, declaring that "two can play that game." Republicans have, so far, lost 27 seats in the House. But compared with his immediate predecessors, Trump has good reason to tout that number as a success. 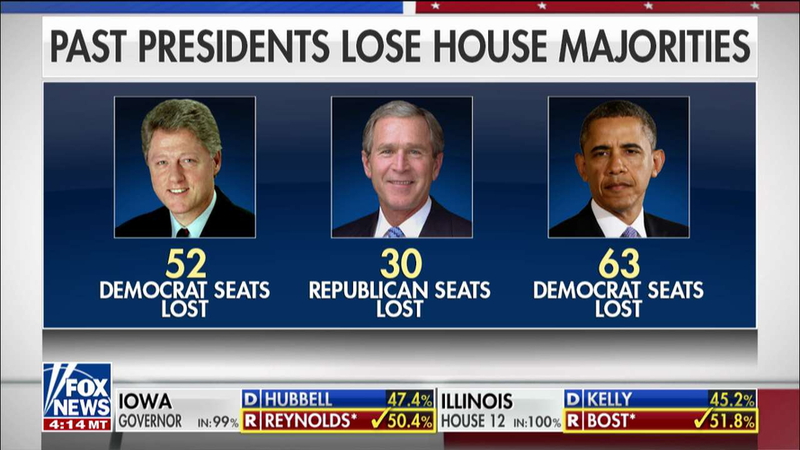 Clinton's Democrats lost 52 seats in his first midterm vote, while George W Bush lost 30 Republican seats and President Obama lost 63 Democratic seats in 2010 (before losing 13 more in the 2014 midterms). While last night's election will undoubtedly be the main focus, Trump could choose to pivot to any number of issues. Though he has said drug prices won't be discussed, an expected reshuffling of his cabinet, his plans for infrastructure reform and demands for Democrats to authorize funding for his promised border wall could all be on the table. Goldman Sachs explored some of these issues in a guide to what gridlock means for our economy published on Wednesday.